Villa Ephrussi de Rothschild (also known as Villa Ile de France) is one of the landmarks of Saint-Jean-Cap-Ferrat. 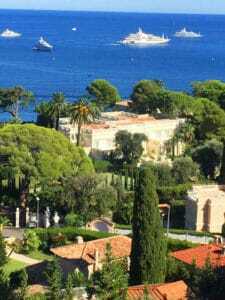 Perched on a promontory, the pink-red mansion boasts full views of the Mediterranean and the port of Cap Ferrat below. The architect Aaron Messiah built this sumptuous Venetian-style mansion for Beatrice de Rothschild, the wife of the banker Maurice de Ephrussi. Beatrice was a great lover of art and period furniture, especially from the 18th century. Her unlimited wealth allowed her to decorate her mansion with period furniture, sculptures and objets d'art, Great Masters’ paintings and an impressive collection of rare porcelain, and create a set of fabulous gardens. She bequeathed them all to the Academy of Fine Arts in 1933, a year before her death. 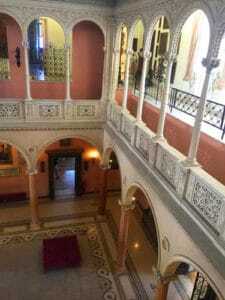 The Villa Ephrussi de Rothschild was classified Historical Monument in 1996 and is open to the public. Who was Baroness Beatrice de Rothschild? But let's go back in time to meet Beatrice, the daughter of Baron Alphone de Rothschild. Born in 1864, she grew up among the extensive and exceptional collections of art accumulated by her father. At 19, she married Maurice Ephrussi, but this unhappy marriage ended 21 years later with a divorce. Indeed, the couple couldn't have children because Ephrussi contaminated her with a 'shameful disease'. Maybe Beatrice compensated by accumulating works of art throughout her life? Not only did she develop the passion for art when she lived with her father, but also the knowledge that allowed her to acquire exceptional collections over the years. Beatrice inherited an immense fortune, as well as the title of baroness, when her father died in 1905. She then embarked in creating the mansion of her dreams on the isthmus of Cap Ferrat, a site she fell in love with at first sight. However, the plot of land, although wildly beautiful with breathtaking views of the sea, was then a rocky promontory difficult to reach. This didn’t stop Beatrice from pursuing her dream villa, as money was obviously not an issue! First of all, the plot had to be transformed to become constructible, so the gardens were landscaped before hand. She hired one of the best landscape architects of the time, Achille Duchêne. Duchêne succeeded in transforming the rocky promontory exposed to the winds into a fabulous 'jardin à la Française'. Neither cost nor means were spared; the rocks were dynamited to even and landscape the site, and gigantic volumes of vegetable earth brought in to fertilize the bare land. Duchêne gave the French garden the shape of a ship so that Beatrice could admire it from the loggia of her (future) villa. This loggia was later built like the deck of a ship, surrounded by the sea and the garden. She drew inspiration during a cruise on the Ile de France steamboat. She even called her mansion Villa Ile de France and ordered her 30 gardeners to always be dressed as sailors with a red pompom beret! Once more, Beatrice had a very specific idea of what her mansion should look like and rejected many proposals from renowned architects. She finally chose the project of Jacques-Marcel Auburtin, assisted by Aaron Messiah. Beatrice moved in the winter of 1912 and regularly stayed in her mansion for the next 10 years; she indeed shared her time between her properties in Paris, Monaco and Deauville! She amassed her fabulous art collection during this decade. Train wagons loaded with furniture and objets d'art regularly arrived at Beaulieu station where she went in person to select those who would decorate her mansion. The others remained in the wagon and sent to her Monaco property. Beatrice retired to Davos (Switzerland) where she died of tuberculosis in 1934. The previous year, however, she had bequeathed her beloved 'villa', gardens and art collections to the Academy of Fine Arts. In 1934 the landscape architect Louis Marchand restored the French garden and created the thematic gardens; Spanish, Florentine, stone garden, Japanese, Mexican (now Exotic), Provençal and rose garden. He returned them to their past splendour after WWII. 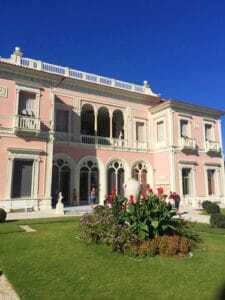 The mansion was also renovated and its ocher-yellow façade repainted in pink-red, a colour reminiscent of the Venetian style. 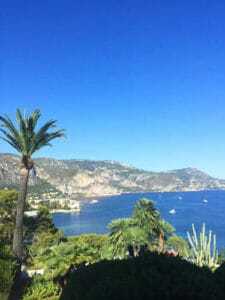 Villa Ephrussi de Rothschild and its gardens delighted visitors until the winter of 1985. Indeed, the sub-zero temperatures destroyed trees and plant species acclimatized to the mild Mediterranean climate. Those in the area most exposed to the marine winds, in particular in the Mexican Garden, were decimated. 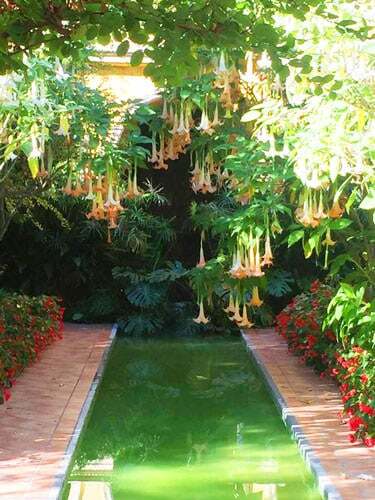 A neighbouring family, great collectors of exotic plants, generously donated cacti and exotic vegetal species to recreate the garden, which has since been known as the Exotic Garden. 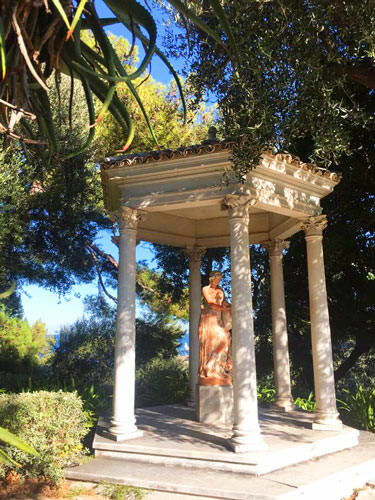 In 1991, the Academy of Fine Arts entrusted the management of the Villa Ephrussi de Rothschild and its gardens to Culturespaces. The foundation has since completely renovated the mansions’ interior as well as the gardens, which are classified Notable Gardens of France.